As you may know, I live in two worlds at the same time. I am dedicated to the service of the Jewish people and to the religious teachings and wisdom of the rabbis. At the same time, my other foot is in the world of science. And, it is in that world that I want to speak of in my blog this week. Something scary is about to happen. The finger of God is giving a message to all the peoples of the Earth. This is a sign of imminent catastrophe. The day of judgement is upon us. 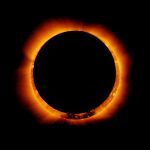 Well, that is the message that some Jewish and Gentile organizations are saying about the imminent solar eclipse on August 21, 2017 beginning at about 10:30 AM. In this purely natural and anticipated event, too many people see signs and portents of things to come. Frankly, welcome to the Middle Ages. This is exactly why religion and faith are disdained by so many people. When others who claim to speak for a religious community say ridiculous things, scientifically literate people turn off and turn away. People who are afraid of the eclipse are the same people who think the world is flat and the sky is a sphere. Perfectly appropriate for the 8th Century. Not so much today. So how did different societies see the eclipse? People in ancient China saw the eclipse and thought a dragon was eating the sun. Mediaeval Christians saw it as a sign of God’s judgement against God’s enemies. Jews saw it as purely a physical phenomenon but they certainly imbued with metaphor. The king in the midrash is always God. The people at the table are the Jewish people and, of course, lantern is the sun. The moon obscuring the sun is the king’s servant (i.e., the angels who do God’s bidding) who takes away the lantern. The metaphor is that sometimes God brings punishment and things ‘go dark’ for a while but, in reality, the light is still burning and it is brought back after a time. This is a typical Rabbinic midrash about God’s punishment and love for the Jewish people and is a good representation of the kind of midrash we see throughout the books of Lamentations and Deuteronomy and many other places. I can live with the metaphor because it is a message of history and hope of and for the Jewish people. But I won’t go beyond the metaphor and give it literal credence. For this solar eclipse, even though it may have a Jewish metaphor attached to it, is really just a passage of the moon between the earth and Sun. There is nothing scary about it (even the Jewish metaphor is not scary). There is nothing mystical about it. There can certainly be something spiritual about it since we get to experience a natural once in a lifetime occurrence. But, please, keep it real. This is not a magical moment in that it came out of nowhere. It is a natural moment. (In fact, so predictable are these events that the next total eclipse that will be visible to us is on April 8, 2024 – something to look forward to!) It is not, as some commentators want us to believe, ‘the Finger of God in the heavens.’ It is the result of gravity and orbital dynamics and angular momentum. If anything, God is enjoying the view as much as we are! The eclipse must not make us revert into frightened little people praying for Gods salvation from the heavens removing the Sun. We don’t need that kind of superstition and Reform Judaism keeps its distance from such thoughts. Rather, look up the sky (with the proper kind of filters, by the way and don’t look into the Sun!) and enjoy the view. Say a blessing of thanks that you are able to witness the heavens at such a time and praise God who ‘sets the stars in motion’ and who, like the rest of us, wants us to enjoy the dance we will only get to see once in our lives.